­ In 2014 the BIO-TIC project introduced the definition of drop-in biochemicals as: chemically identical bio-based versions of petrochemicals which have established markets. 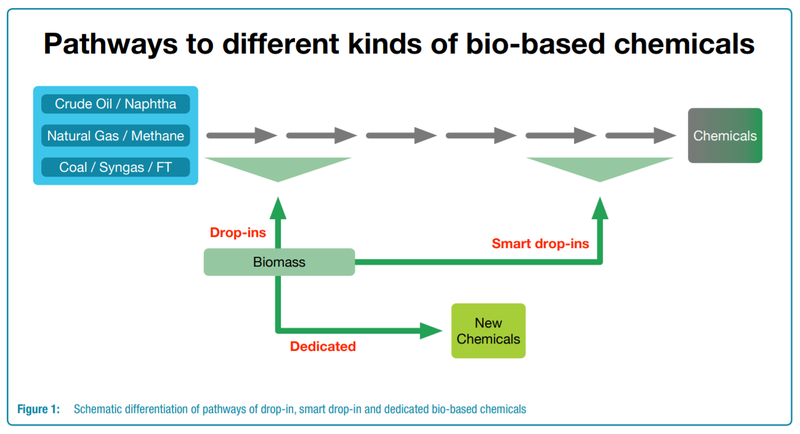 In 2017 nova-Institute and their colleagues from the RoadToBio consortium identified a separate sub-category of smart drop-in in biochemicals for which the production pathways have significant advantages compared to their identical fossil-based counterpart, and a third category of bio-based chemicals which do not have an identical fossil-based counterpart (dedicated bio-based chemicals). ­ Bio-based drop-ins are defined as chemically identical to their fossil-based counterparts. Therefore bio-based chemicals classed as ‘drop-ins’ tend to replace high-volume commodity chemicals such as bio-based ethylene, polyethylene, polyethylene terephthalate, propylene/polypropylene, methane, etc. It is generally relatively easy to integrate bio-based drop-ins into existing chemical production chains, as existing infrastructure can be used for their distribution and processing. Therefore they can enter value chains at a relatively early stage (Figure 1). Bio-based drop-ins usually offer advantages in their environmental footprint, however, they are often more expensive to produce than their fossil counterparts, presenting a barrier to their uptake. ­ On June 19th, the second RoadToBio workshop will take place in Brussels. ­ In the next newsletter we will present the webinar "The best of two worlds - making chemicals more bio-based". In this webinar, three project partners discussed the importance and possibilities of biotechnology in the context of the chemical industry and demonstrated its potential.